The 2011 LEYTR Railrover was serialised on the main LEYTR Blog on a day-by-day basis. The LEYTR Jaunts repository blog has amassed the seven days' worth of entries into one post and is detailed below. 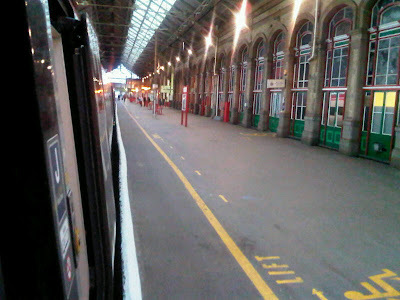 Greetings from aboard Virgin Trains' 390006 Tate Liverpool, as we head south along the West Coast Main Line. The daily blog entries will consist of a number of photos taken during the day with some comments beneath each - this being the first of the 2011 LEYTR Railrover. 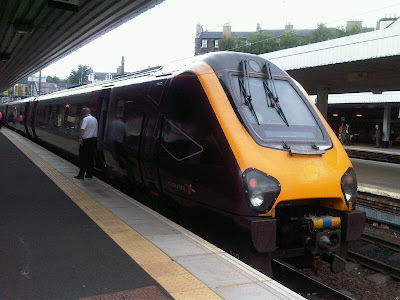 My first trip was from Peterborough to London King's Cross aboard First Capital Connect's 0546 departure. 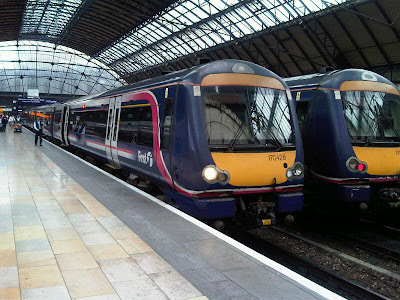 1P61 was formed by two four-car Class 365s, with 365528 leading and 365511 trailing, though I sat in the latter - in the first class compartment. 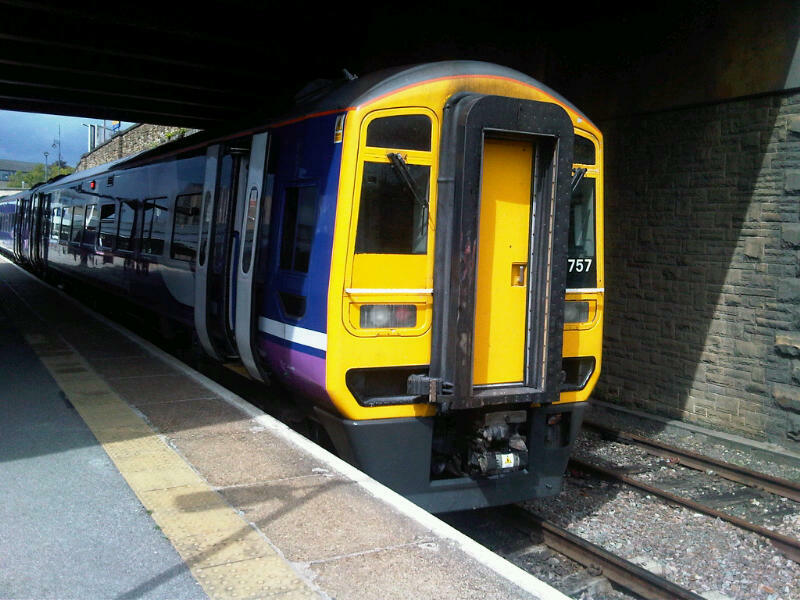 The Revenue Protection Officer's words when he clocked my All-lines Railrover was: "We don't see many of those!" 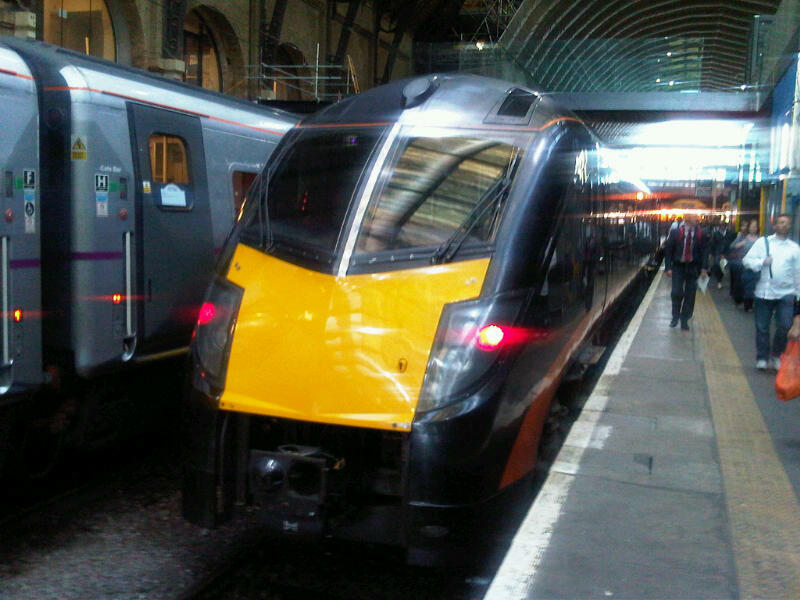 In London we boarded the exceedingly busy 1N20, Grand Central's first Sunderland service of the day at 0747. When I say it was busy, it left The Cross full and standing. The guard declassified first class so plenty of people entered. Complimentary refreshments were still offered upon production of our ticket and we had to go to the buffet. Neither m'colleague nor I had ever travelled with Grand Central before and it was a very pleasant experience. There does, however, appear to be ridiculous amounts of time for stations north of York. 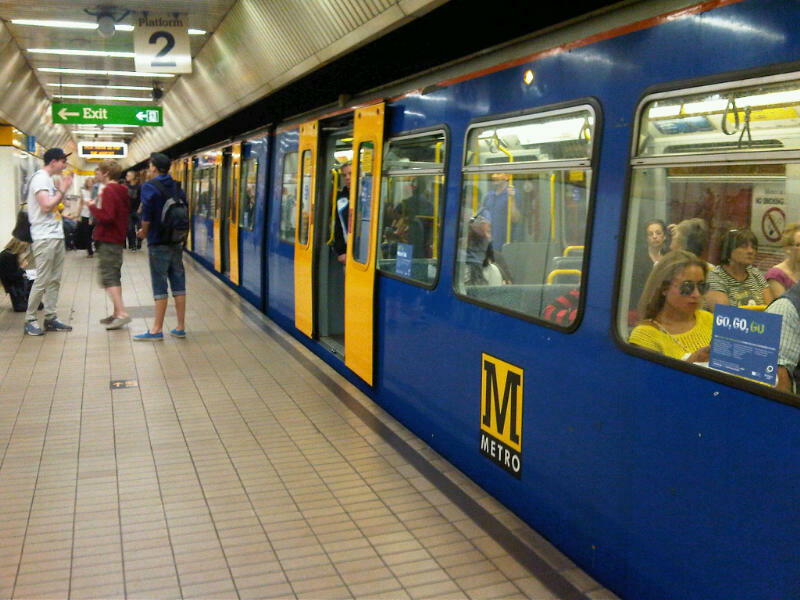 We waited on numerous occasions at Northallerton and Eaglescliffe. Outside Hartlepool we arrived so early an announcement was made to say we wouldn't be allowed in until our booked arrival time. Even then we had a further 7 minutes to dwell. So any claim that Grand Central is feeling an adverse effect on its Sunderland-London journey time as a result of East Coast's new ECML timetable is a little off-the-mark as they could take out at least 10 mins between Sunderland and York. The only other niggle I had is that seat reservations were not put out as (and I quote): the train arrived late into King's Cross last night. Not long before East Coast's 91126 arrived at Newcastle platform 2, working 1S10. It arrived a little ahead of its booked time (1238) and we left spot on at 1240. A nice scenic run up the northern end of the ECML, with lovely views of the North Sea and the viaduct immediately before Berwick. And before that the tightest curve on the line at Morpeth. We arrived into Edinburgh 7 minutes early on platform 11 and luckily we didn't have far to go as our ScotRail service to Glasgow Queen Street (then Milngavie) left from 12 - and it was in. Some nice shots of 334018, before it left at 1437, working 2M29 via the new Bathgate-Airdrie link that was re-opened on 12 December last year. It's a pretty nondescript line though - the scenery is nice enough but nothing spectacular - a bit like the Strathclyde Passenger Transport livery First applies to its trains; they don't do the units justice. In Glasgow it is only two blocks to the hive of activity that is the Buchanan Street Bus Station, so we headed there for a quarter of an hour for some photos. 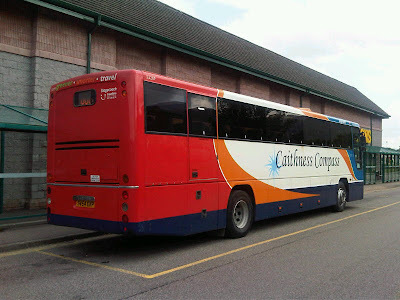 Park's of Hamilton was working a private hire to the Rhineland using a Plaxton Elite. The Citylink Gold colour scheme really is very impressive. A wander to Glasgow Central and we jumped aboard the 1640 Virgin Trains service to London Euston. 1M17 was formed by 390006 Tate Liverpool and we currently have the entirety of Coach K to ourselves. Just this one journey would cost £207.50 (First Anytime Single, Glasgow-London). We're staying in London overnight and heading out first thing to North Wales. I'm sure we'll both sleep well! After an early morning in London - so early that we missed out all-inclusive breakfast at the LSE's Carr-Saunders Hall - we caught Virgin Trains' first departure of the day from Euston at 0810. 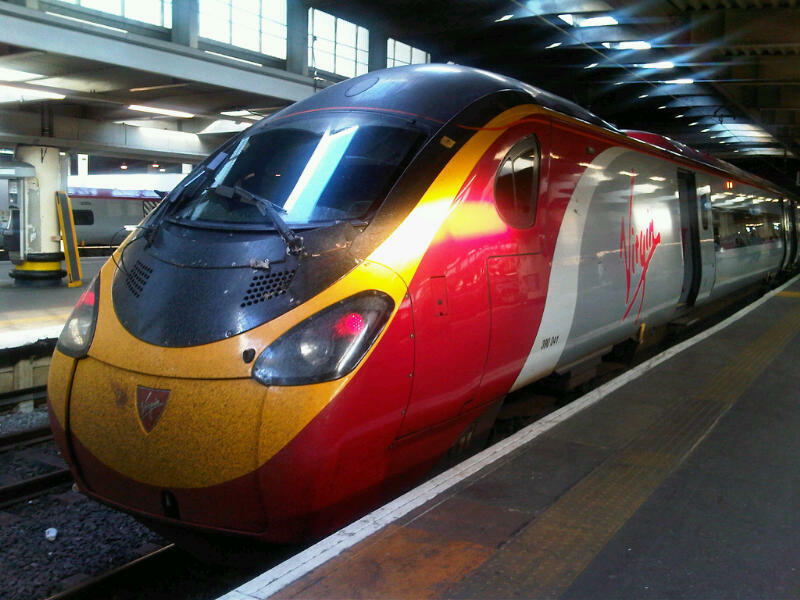 We left from the same platform that we arrived from yesterday (13), though the Pendolino was different, 390041. It was a very enjoyable run along the increasingly familiar West Coast Main Line. An additional 15 minutes running time has been added to the journey on Sundays, in case engineering work forces it to operate via Northampton, so we flew through Rugby 15 minutes ahead of time. Our guard apologised for us being held south of Stafford and that "it would not have an adverse effect on our journey time". He seemed like a great guy (called Steven), with the voice a cross between 'Brother' Crow and Ray Winston. We had a quick look around Virgin's refurbished Cheshire Lounge at Crewe station. Very nice it was too. It was a little odd having to show our tickets to a camera before being allowed access though. 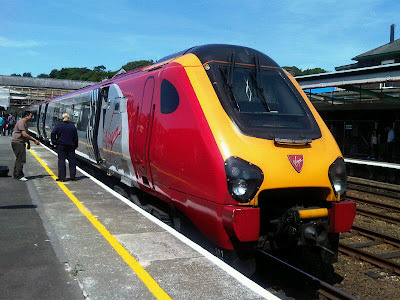 Next it was to Platform 12 for a Virgin Voyager - 221113 Sir Walter Raleigh - where we caught the 1042 service bound for Holyhead, though we bailed out at Bangor. On board, the train was very full indeed when we left, even more so at Chester. It was a very pleasant journey along the North Wales coast. A chat with the Holyhead-based guard (who relieved a Scots chap at Chester) was interesting; she was telling us that she sees a fair amount of variation, with duties that take her to London. Bangor was the location of our first (and penultimate) journey by bus during our trip. Service X32 forms part of the TrawsCambria network and operates between Holyhead-Aberystwyth, though our Sunday journey commenced at Bangor and was operated by Lloyds Coaches. 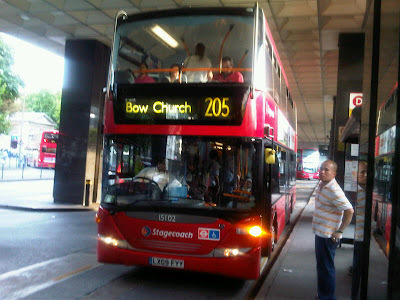 They used LL09 WYN, an ADL Dart/Enviro200 B29F. It was the sort of journey that despite the light loadings, is difficult to keep to time on. We ran a few minutes late throughout and at one time clocked our bus doing its top speed of 57mph along the A487. Arriving a few minutes late in Porthmadog, we meandered to the Ffestiniog Railway station. It was 1435 and our train wasn't due to depart until 1600. Much to our surprise, an additional departure at 1500 was now scheduled as today's timetable had been disrupted as the result of a lineside fire earlier. Our First Class All-line Rovers were valid in the First Class section at the rear of our train (we checked first), so we sat an enjoyed our wonderful 13.5-mile journey into Snowdonia. Our train was hauled by Iarll Meirionnydd/Fairlie's Patent. The guard commented that he'd never seen First Class All-line Rovers before in his 10 years at the company yet today we were the second to present them to him. Our connection at Blaenau Ffestiniog was to be 0:10, but thanks to our bespoke journey from Porthmadog we now had a much more comfortable 1:10. 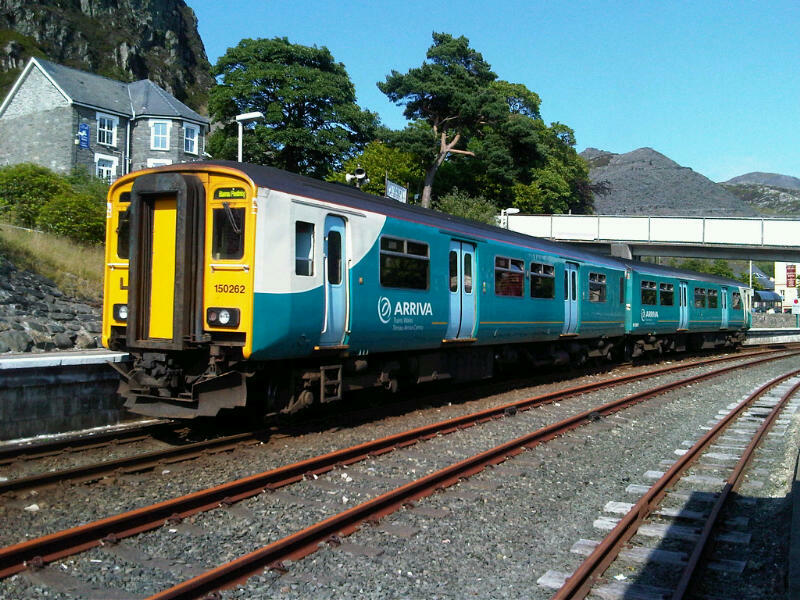 Arriva Trains Wales provided 150262 on their last departure of the day from there at 1730. 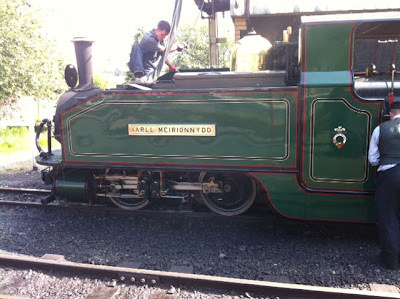 Whether it is supposed to await the arrival of the Ffestiniog Railway's 1720 arrival or not, we did not know, but were glad we didn't have to find out. The Ffestiniog Tunnel is one of the first things travellers on the Conwy Valley Line will notice as they leave Blaenau Ffestiniog. At 3522m/3853yds I believe it is the longest tunnel on a single-track line. The train was lightly loaded though at Llanwrst a number of people who had been re-enacting in a field somewhere boarded - their spears and chain mail appeared to weigh them down on this very humid summer's afternoon. We arrived a couple of minutes early at Llandudno Junction, so we were, for the first time, able to catch a train that wasn't in our official itinerary: Arriva Trains Wales' 1827 train to Holyhead. We'd been booked on the 1924 as we weren't due in until 1829. Our conductor Joe was very courteous and chatted for some time. He was a bastion of his profession, pointing out places of interest on route, from Snowdon to the barracks where Prince Harry is based. He also gave us some insider information regarding the first train of the day tomorrow. It's an early start so I shall retire to watch Top Gear. 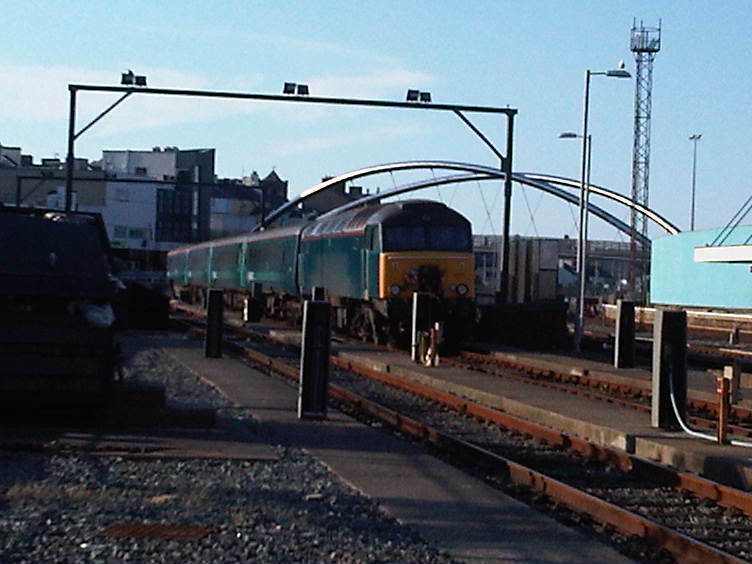 Today was the earliest start of the entire week as our first train departed Holyhead at 0532. 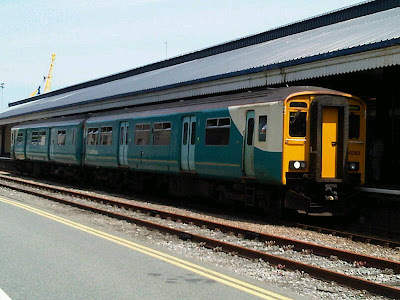 Known within enthusiast circles as The WAG (Welsh Assembly Government-funded) Express, this is a once daily loco-hauled service between Holyhead and Cardiff Central, timed to appeal to commuters and shoppers bound for the Welsh capital. I conveniently timed return train from Cardiff also operates, worked by the same stock. It is operated by Arriva Trains Wales who refer to it as The Premier Service. First Class travel requires a compulsory reservation, or so the timetable states. A total of 24 seats are located in First Class and at no point today did more than 13 travel at any one time, ourselves included. We reserved out seats but the depot at Holyhead had run out of reservations slips. Another very friendly and approachable Arriva Trains Wales guard worked the service, being relieved at Chester. She even offered to photograph us both, spotting we were making the most of the journey. A number of regular passengers appear to travel, with one chap having his coffee poured for him before he took his seat. Service indeed. Four mk2s were hauled by 57313, which we understand is allocated to Virgin Trains, though the entire set was in Arriva Trains Wales livery. It was a very civilised start to the day and the complimentary three-course breakfast was superb. It was another one of those absolutely faultless journeys. 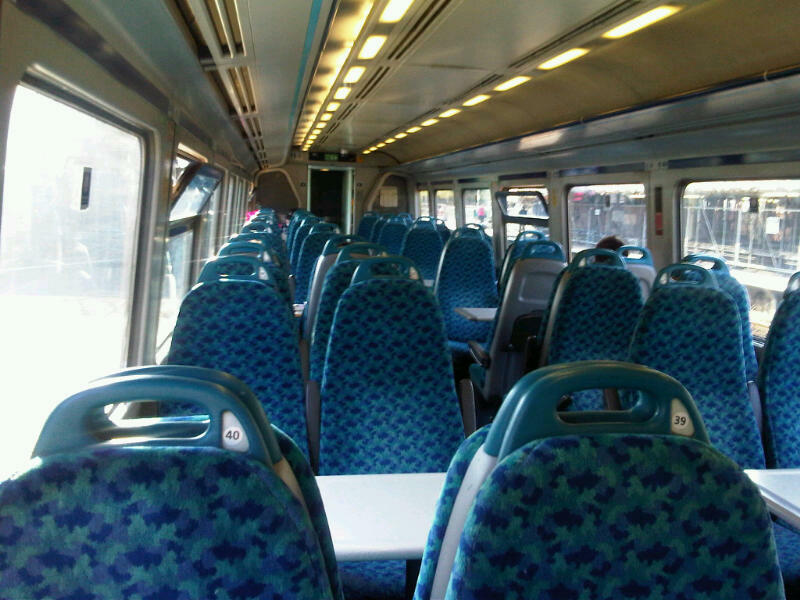 There then followed a gap in First Class travel for precisely 5:30 as we headed west on one of Arriva's Sprinter services to Fishguard Harbour. The 1057 departure was formed of 150260. The female guard's announcements prior to departing were not what I considered "text book" but they ensured no one was on the wrong train. Sometimes this tack can prevent considerable inconvenience to both passengers and crews alike. Basically, two trains were on Platform 4A about six feet apart and she ensure quite successfully that no one boarded our train by mistake. We only stopped twice in the 2:28 journey to Fishguard Harbour, with the '150' running at top speed (75mph) at almost every possible occasion. Almost an express service for such a unit. We arrived early so had longer than the booked 5 minutes at Fishguard Harbour. There's no arrow of indecision noticeable at the station, nor is there any traditional railway-style station name. A load boarded, fresh from the Stenna Line ferry that was berthed opposite and at 1330 we began our return. The train was booked to Cheltenham but we alighted after half-an-hour or so at Whitland. There appears to be very little to do here so we stayed on Platform 1 and a few minutes ahead of time ATW's 153303 arrived, bound for Swansea. It has come from Pembroke Dock. I didn't consider that it would be a '153'; indeed, I assumed it would be a busy run as in the relatively short distance it had travelled a total of 9 stations had been called at. The train, however, was dead quiet and after a crew change (and reversal at Carmarthen) we arrived early into Swansea. Next was First Great Western to London Paddington. Our '153' was due to arrive 6 minutes before a London train left so I'd booked us on the one an hour later, but we managed to catch the 1528, formed of 43026 (leading) and 43165 (trailing). 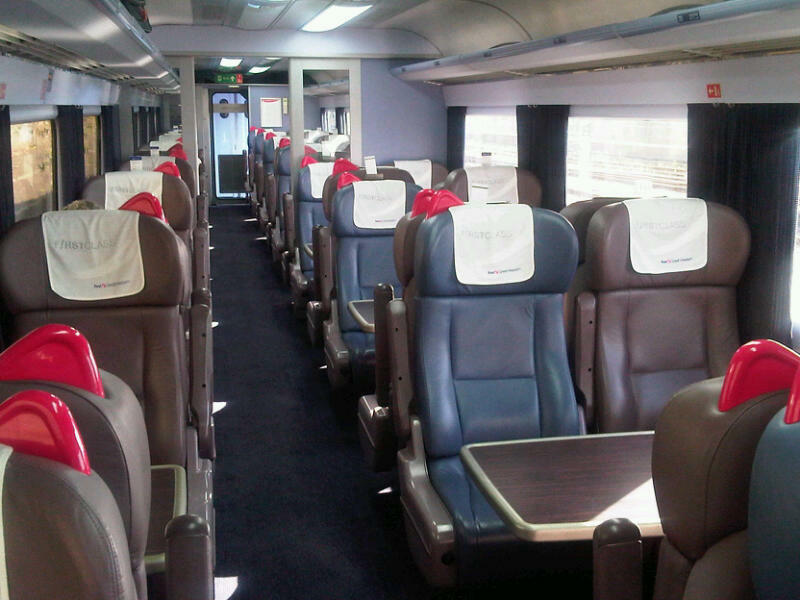 The last time I travelled in FGW's First Class was in 2005 and since then the ambiance has been improved no end with leather seating throughout. A problem with the heating in Coach G meant that few people wanted to sit in there so our coach (H) was very busy indeed. Just outside Didcot Parkway we slowed very quickly indeed and moved onto the Down Main line to pass a failed HST. We believe it was the 1500 Newquay-Paddington. We were incredibly lucky not having to even stop as there are onto two lines along this section of route. The delay was just 13 minutes in total. Time for our second (and final) bus ride of the jaunt: Stagecoach East London's Service 205 (Paddington Basin - Bow Church) between Piccadilly and Euston. We had 15102 (LX09 FYY), a Scania OmniCity - an integral bus that is rare within the Stagecoach Group (though purchased by East London Bus Group before Stagecoach re-purchased the operation at the end of last year). I'm typing today's entry up in Virgin's First Class Lounge before we head to Aberdeen using the ScotRail's Caledonian Sleeper service. I'd hoped for a quick photo to upload but when we arrived at 1910 it had yet to pull onto Platform 15. Problems on the MML mean Euston is very busy, with passengers being permitted travel with London Midland and change at Tamworth. Today was the most uneventful of our week-long jaunt as it is the day that we sat on the same train for thirteen hours and twenty two minutes. 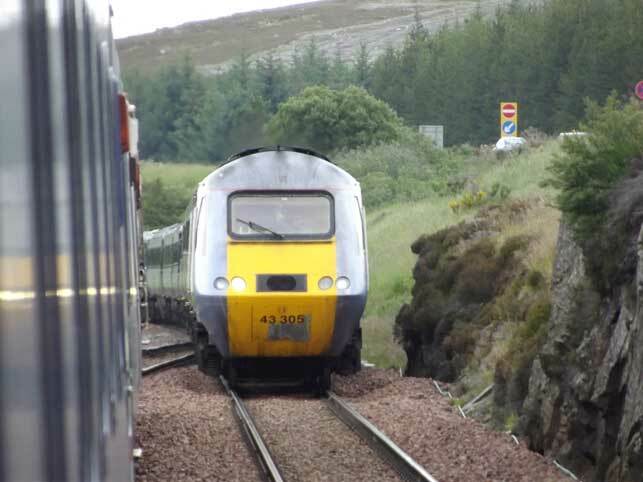 1V60 is the headcode for CrossCountry's 0820 departure from Aberdeen bound for Penzance, where it is booked to arrive at 2142. 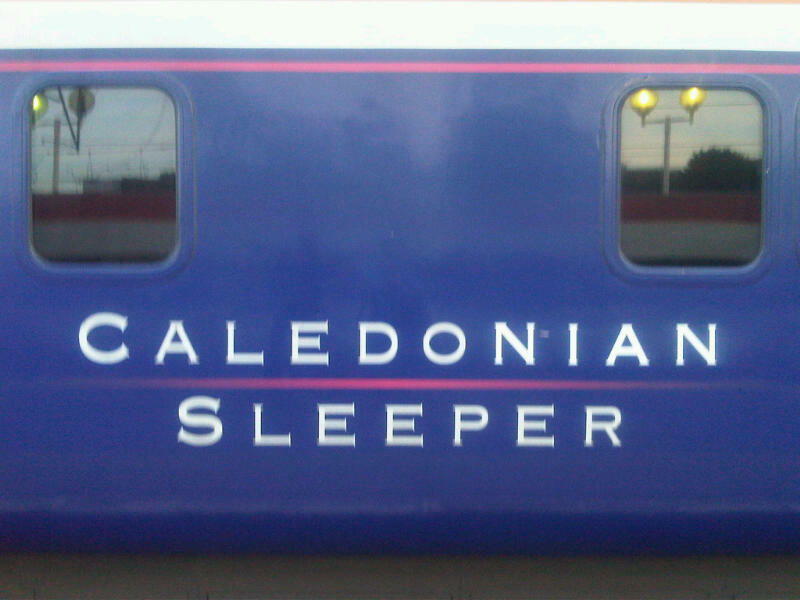 But before that, there is the small matter of last night's sleeper service to comment on. Platform 15 at London Euston was the place to be from 2030hrs when ScotRail's Caledonian Sleeper began boarding. The service runs six days a week (Sun-Fri) in both directions. 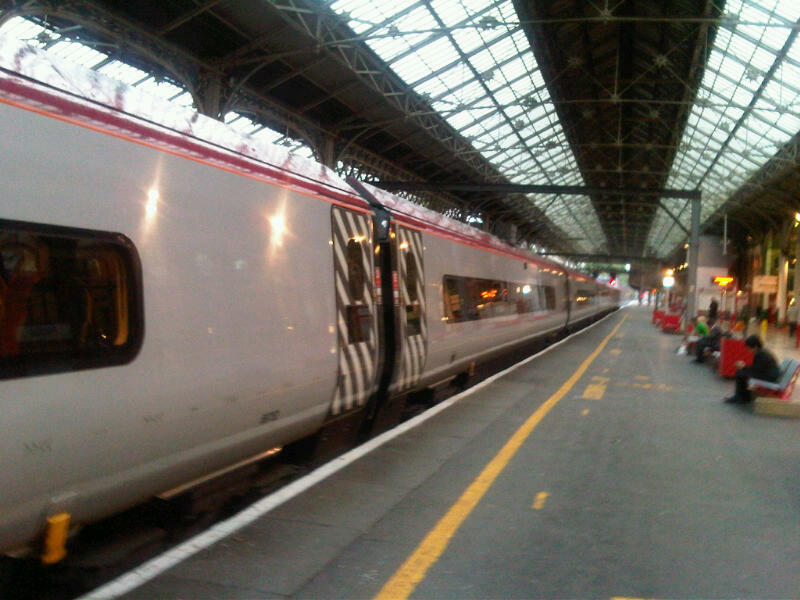 A Class 90 hauls the sixteen-carriage train along the WCML to Edinburgh, where it splits into three separate trains, one for Fort William (the front four coaches), one for Aberdeen (the next six carriages) and one for Inverness (rear six carriages). 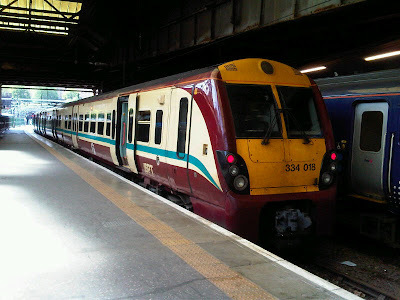 We were headed for Aberdeen so headed to the carriage in which our booked berths were. Although it was Coach B, this was found slap bang in the centre of the train. The set is stabled during the day at the Wembley depot and as it was humid yesterday the interior temperature was pretty impressive, more so in the berths than the vestibules and corridors. 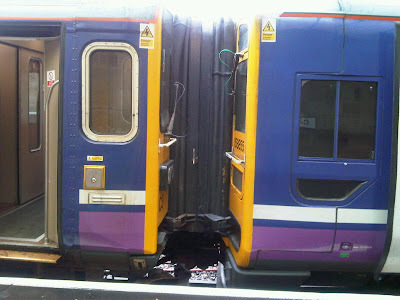 Our host (one per two carriages I believe) assured us that by Watford Junction we'd feel the air conditioning properly. This never happened. Otherwise, it was an excellent journey, as ever. 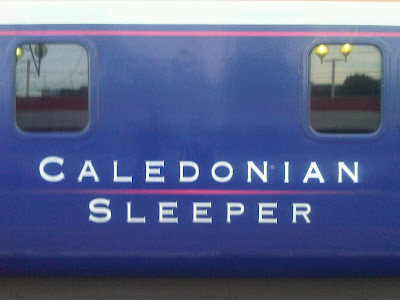 The Aberdeen route is the final sleeper service I needed to 'bag', too. To say our motive power, 90036, was capable is an understatement. Within 10 minutes we recorded our speed to be 83mph. We spent between 2300-midnight in the lounge car sharing a bottle of wine. Breakfast was served at 0640 - nothing to write home about, but there were three different types from which to choose - and we arrived in Aberdeen fifteen minutes early at 0720. Time for a look around the station and to make use of ScotRail's First Class Lounge before boarding the train that was to undertake the 772.21 mile journey to Penzance, calling at a total of 45 places. All destinations were listed on the departure screen at Aberdeen and it took three pages. It is the longest train journey in the UK and can only be undertaken in this direction, since its northbound equivalent commences at Plymouth. 220024 was to be our home for the next thirteen-and-a-bit hours. Despite our seat reservation request saying otherwise, our reserved seats faced backwards so we sought unreserved seats. At 0820 we departed. 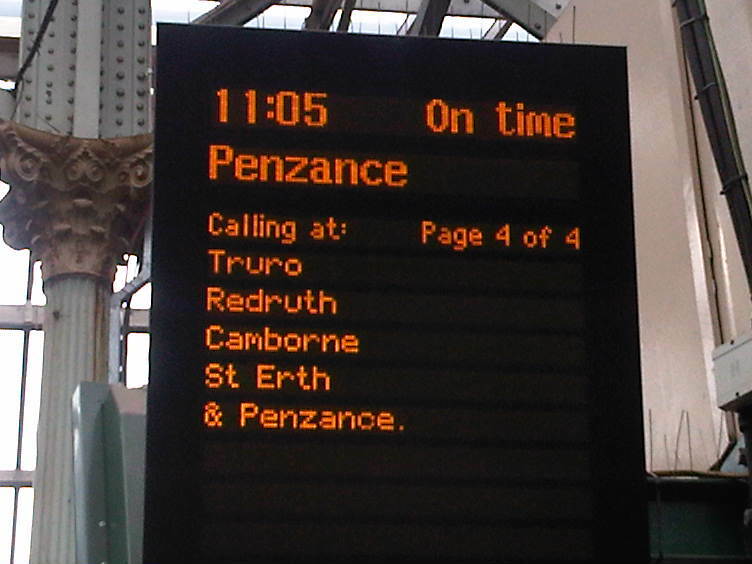 At no point until our Cornish arrival did we operate in excess of 4 minutes late. It was a journey that even in the bus industry would have been categorised as 100% punctual. 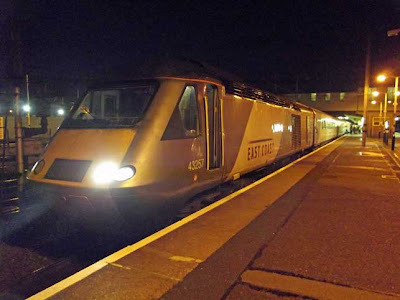 It was, however, a little boring, though less so than our Top 'n' Tail trip during 2009 when we travelled from Edinburgh to Penzance on the erstwhile National Express 336. Back then it formed part of our John o'Groats to Land's End jaunt. This time, however, we were in First Class and being waited on (well, between Edinburgh and Plymouth, anyway). Some said that being on a Voyager was punishment enough, and while I concede that a HST would have been more preferable, the journey wasn't uncomfortable at all. There were a total of five drivers (they changed at Edinburgh, York, Birmingham & Exeter), six train managers (they changed at Edinburgh, Newcastle, Leeds, Birmingham, & Exeter), two retail managers (Edinburgh-Birmingham and Birmingham-Plymouth) and three first class hosts (Edinburgh-Newcastle, Newcastle-Birmingham and Birmingham-Plymouth). Other than us, the only others who travelled anything like the distance we did in First Class did so between Dundee-Bristol Parkway. We arrived in Penzance bang on time and witnessed the Cornish Riviera sleeper service leave, headed for London. A tiring day but nonetheless satisfying. 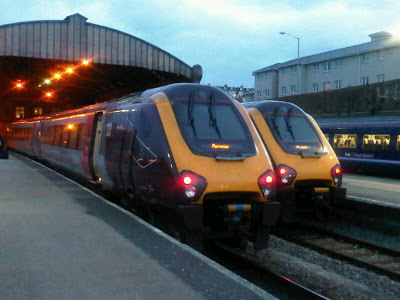 Morning broke at 0844 when our First Great Western service to London Paddington left Penzance. At the helm was 43139 that was named after Driver Stan Martin who was tragically killed when his train collided with a car on a level crossing on 6 November 2004. At the rear was 43070 The Corps of Royal Electrical and Mechanical Engineers. Travelling in/out of Cornwall by train is something I've done only once before. It is a wonderful experience. While the speed isn't what you'd expect from a HST, the views and ridiculously high viaducts are no less impressive second time round. Although travel yesterday aboard the Voyager was pleasant, it was very noticeably how more enjoyable it was in a leather-seated mk3 carriage. A mini crisis took hold at Exeter when the hot water boiler failed. 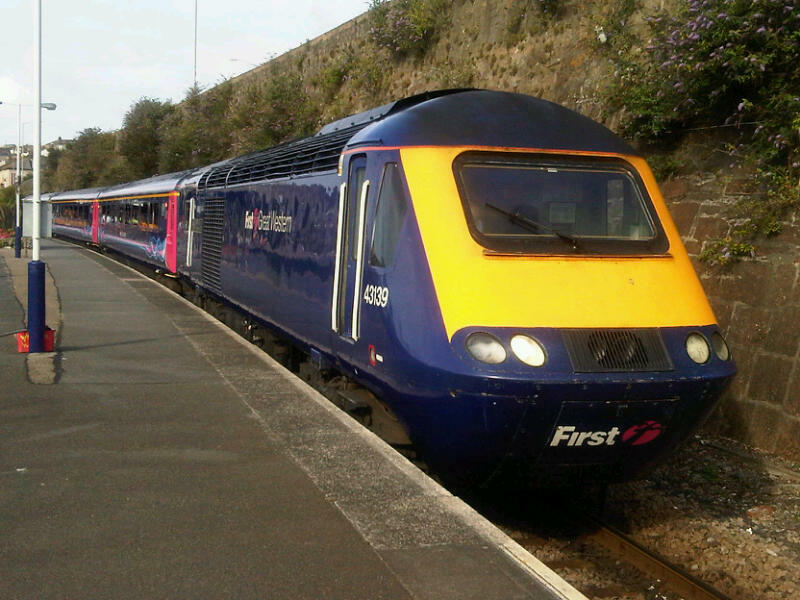 We were held at Exeter for 5 minutes while an engineer looked at it but to no avail. This journey heralded my favourite guard announcement of the journey so far: "If you're leaving the train here please ensure you're alighting onto a platform." Despite the slight delay at Exeter we made good time travelling non-stop to Reading, arriving only one minute late. We didn't have long at Reading so headed to Platform 4A where our next service was loading. First Great Western operate from here to Gatwick Airport every hour and we were aboard its 1334 departure, formed by 166209. The journey was, quite frankly, rather boring when compared to what we've been used to. But it was very punctual and we arrived at Gatwick Airport on time. I had a mini crisis of my own here when I realised some time after we alighted that I'd left a bag on board. I was so lucky for a number of reasons, not least that the service travelled to some sidings for 10 minutes before forming the 1503 return journey from the same platform, so I was able to acquire said bag from the driver trainer at the front. 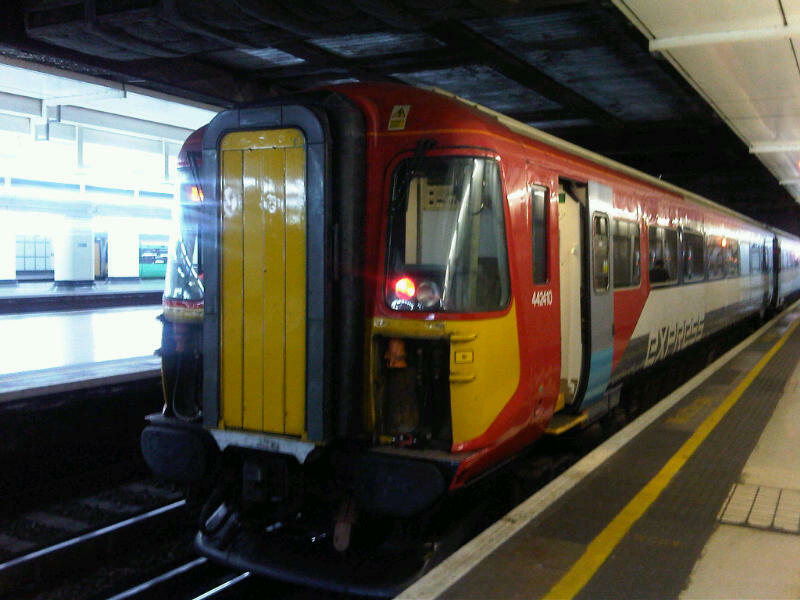 The reason for the run to Gatwick Airport was to try and bag a Class 460 Juniper on the Gatwick Express to London Victoria. 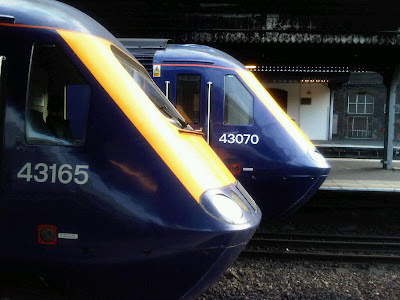 It, however, was not to be as the one I scheduled us to travel on was a pair of 'plastic pigs', Wessex Electric Class 442s (442421+442410). I rather enjoyed them and had never travelled on one before, though m'colleague assured me they'd been extensively refurbished. He also commented that a '442' holds the fastest speed of a third-rail train, at 109mph. A very efficient and speedy trip into London and half-an-hour later we were at Victoria. 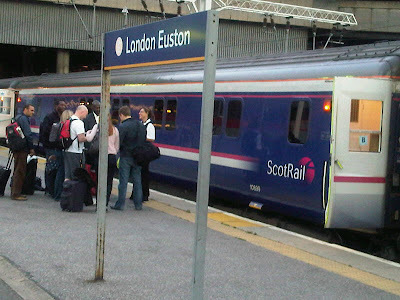 We jumped on the Tube to get to Euston as we were booked on the 1630 Virign Trains 'crack express' to Glasgow Central in their record-breaking journey time of 4:08. This necessitated my first trip on the 2009 Stock, now the sole occupier of the Victoria Line, relieving the remaining 1967 Stock last month. I didn't catch the fleet number!! Our super-fast Virgin Trains departure at 1630 was formed by 390052 Virgin Knight that carries the name of Alison Walters on the train fronts. We took our seats and at precisely 1630 (and I do mean precisely!) we glided out of Platform 13. Progress was as per the running schedule until an emergency brake application between Hanslope Junction and Weedon. Although it was an emergency brake application, no one came out of their seat and no luggage fell from anywhere in our carriage. Sadly, there we sat for a very long time. The 1630 Euston-Piccadilly struck what we now understand to be the overhead power equipment which caused it to blow its circuit breakers but this was later changed to the train brought the overhead wires down. We were the second in line as the 1623 Euston-Wolverhampton was between us both. We were the lucky ones as we didn't lose power and after a considerable length of time undertook a wrong direction move back along the Down Main to Hanslope Junction, where we headed via the diversionary route through Northampton. Once we rejoined the WCML at Hillmorton Junction, it was 1908, not the booked passing time of 1716. We ran just under 2 hours late through to Preston, with an unscheduled stop at Warrington Bank Quay so the London-based driver could return to London. 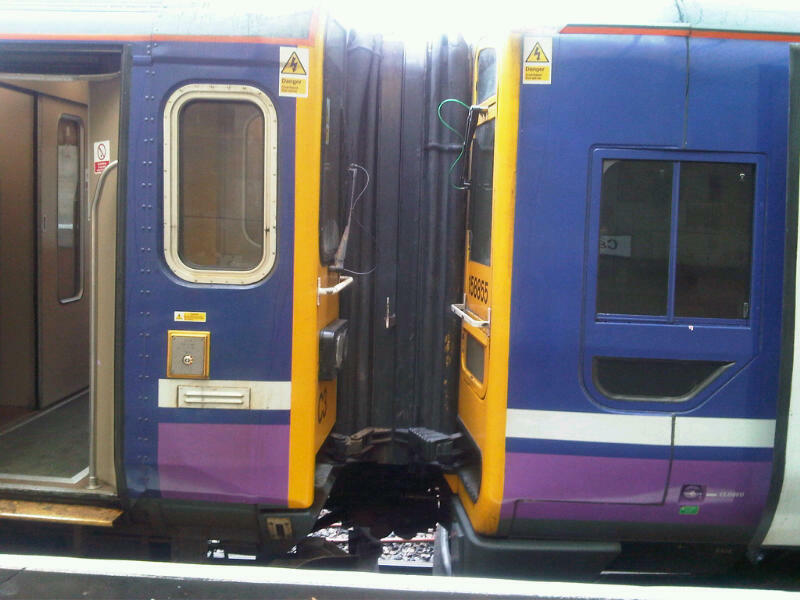 Sadly, a decision was made to terminate our train at Preston and the relief train crew were no longer available. Clearly a decision had been made to schedule this crew to relieve a train that was not as severely delayed as us and, in the cold harsh light of day, it was the right call. We pulled into Preston a rather impressive 2 hours and 2 minutes late at 2032. As luck would have it the 1757 Euston-Glasgow pulled onto Platform 3 at 2039 and departed at 2047, with a scheduled arrival time in Glasgow at 2257, precisely 2 hours 19 minutes after our booked arrival. 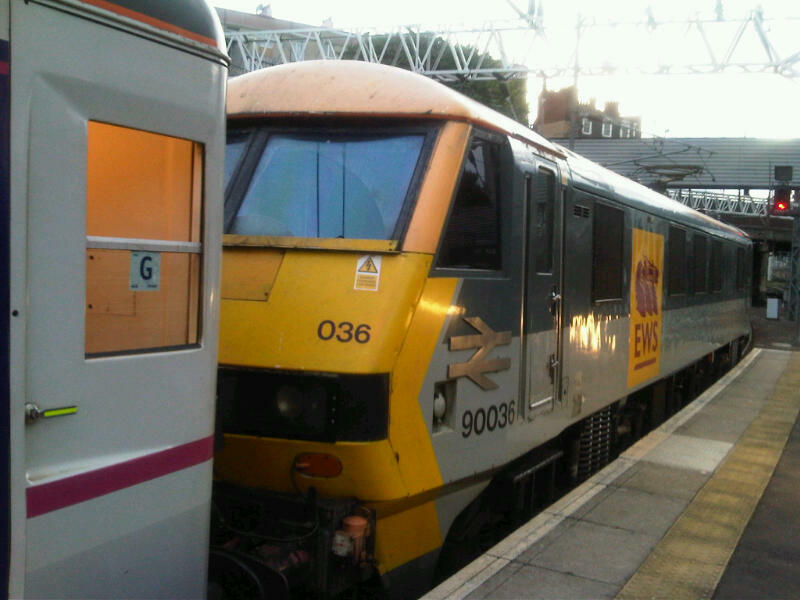 It is 390005 City of Wolverhampton. I'm typing this blog entry up while on this final train - we've just passed the Shap summit (916 feet about sea level, after a 1:75 approach gradient from Tebay). 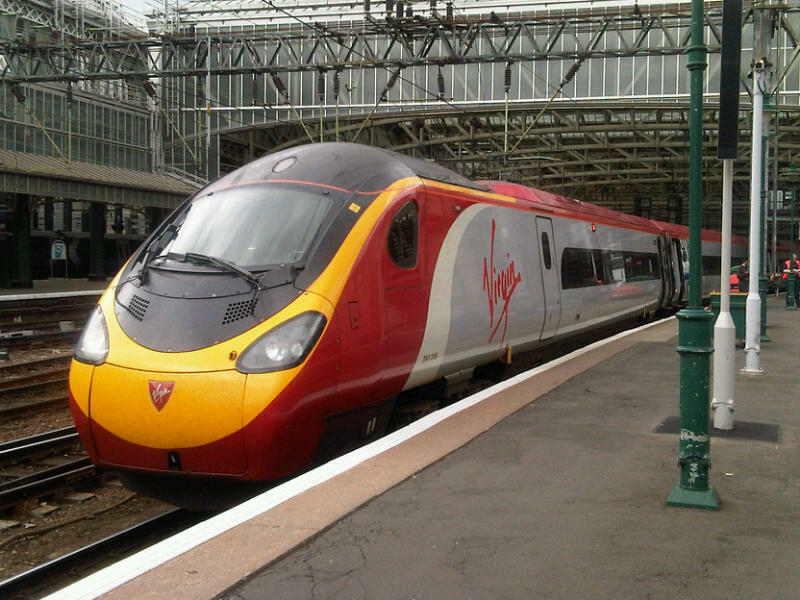 Thanks to Twitter, Virgin Trains contacted me to say the overhead line problem is suspected vandalism. 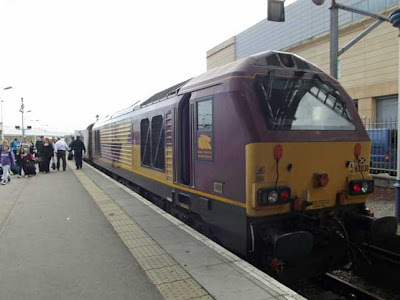 We understand the 1623 bound for Wolverhampton had to be rescued by a Class 57 and ran almost 200 minutes late. Everything considered, Virgin handled the situation impeccably. Announcements, while taking 5 or 6 minutes to come initially, became regular and contained the 'human' touch - the weren't sterile and emotionless. Forms were handed out for passengers to complete which would be passed to customer relations for their consideration on some form of remuneration. Certainly in my carriage there were no complaints, even when the guard very bravely announced our delay was likely to be around two hours. There are no complaints from us about the way the incident was handled, though obviously our severely delayed arrival was a clear inconvenience. It is, hand on heart, the only delay in excess of five minutes we've had for the entire jaunt so far. We get a lie in tomorrow, before heading south and plan to bravely deviate from our itinerary. Following last night's significant delays, we were made aware that what is believed to have happened is that vandals threw one or more objects from a bridge onto the catenary on the West Coast Main Line, with one missile damaging the overhead equipment to the point that part of the mechanism was displaced and hit by the 1620 Euston-Manchester - the train, ironically, managed to continue in service around one hour later. The 1623 Euston-Wolverhampton was less fortunate and lost power and was rescued by a Class 57. We were very fortunate the signaller sent the stop command to our driver before we entered the damaged section. We still got a good 8 hours sleep in, though, as our first train wasn't until 1000 - a Virgin Voyager to Carlisle. 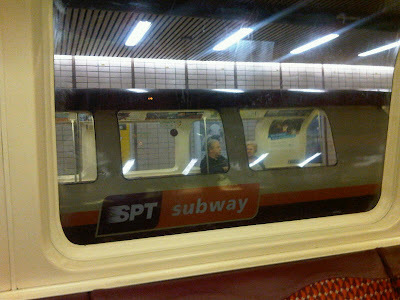 Before that, however, we had a ride on Glasgow's subway section, dubbed the Clockwork Orange. Last time I visited Glasgow, I undertook a circuit on the inner circle; this time we chose the outer circle, joining at Buchanan Street and doing a loop plus one stop, alighting at St Enoch. Our unit was 126 working diagram 5. 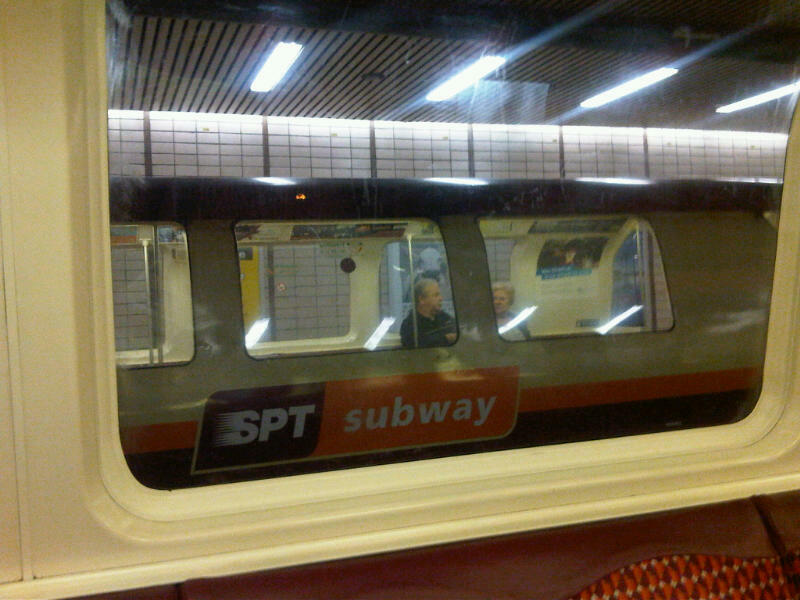 The loop took approximately 27 mins, after which we headed to Glasgow Central. Actually, we cut it very fine indeed, arriving just 5 minutes before 221104 Sir John Franklin departed, bound for Birmingham New Street. As with our last trip aboard one of Virgin's Voyager sets (Sunday, Crewe-Bangor), this was formed of five cars with one being First Class. We made good progress through the edge of the Lake District to Carlisle, arriving on time, and after a very tasty bacon panini. At Carlisle we had enough time to catch up on all the News of the World gossip from the free papers before our next train arrived: 153359+158855, working the 1155 Northern service to Leeds via the iconic Settle-Carlisle line. I'd not travelled on this section of route since childhood so was eager to include it in this week's itinerary. 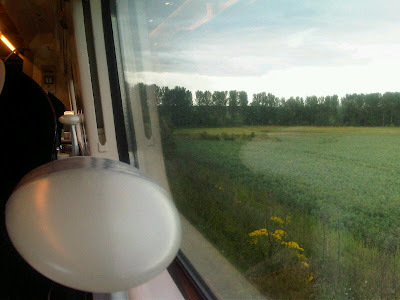 We departed on time and the train was filled with people with ruck sacks and walking boots and we made steady progress. The weather - having been glorious every single day without exception - looked ominous, with very large, black clouds in our direction. At 1300 precisely we passed the line summit at Aisgill (356m/1168ft) and soon after through Dent station (the highest mainline station in the UK, at 1150ft above sea level), before crossing the world famous Ribblehead Viaduct - our guard even announced our crossing. Line speed here is 30mph maximum, lending itself to passengers' enjoyment of the view. Many people lost their lives building the line, not least the construction of these enormous viaducts. While I don't consider the 'drop' to be as great at viaducts that litter Brunel's line into Cornwall, the crossing was no less impressive than I remembered. As a child, my first crossing was aboard a loco-hauled train, comprising a very long rake of mk2 coaches, which I vividly remember stopping twice at Settle - once to accommodate the first few coaches and then moved further up for the second half. Our initial plan was to get off at Ribblhead and photograph the viaduct before returning north on the next available service to Carlisle and then Virgin to London, but we had planned to try and bag a Class 180 working with Grand Central. This we managed by remaining on our Northern service to Leeds (and not alighting at Ribblehead as intended - a good call as it was utter cloud burst as we called there) and catching another Northern service from Leeds to Bradford Interchange at 1453, formed by 158757, bound for Blackpool. 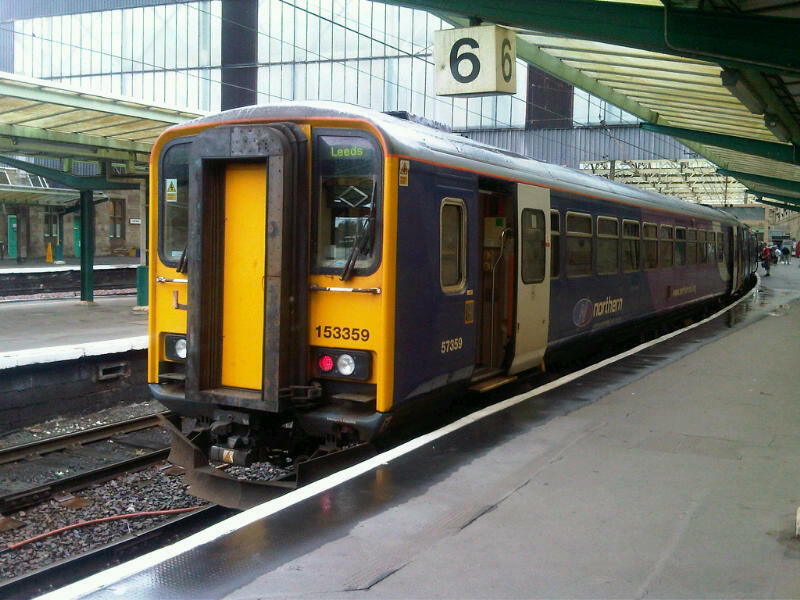 Once at Bradford Interchange we crossed platforms where our Grand Central Class 180 (the company no longer refer to these trains as Adelantes or as we believed they preferred, Zephyrs) was stood. 180104 was our train, looking resplendent in its black livery. 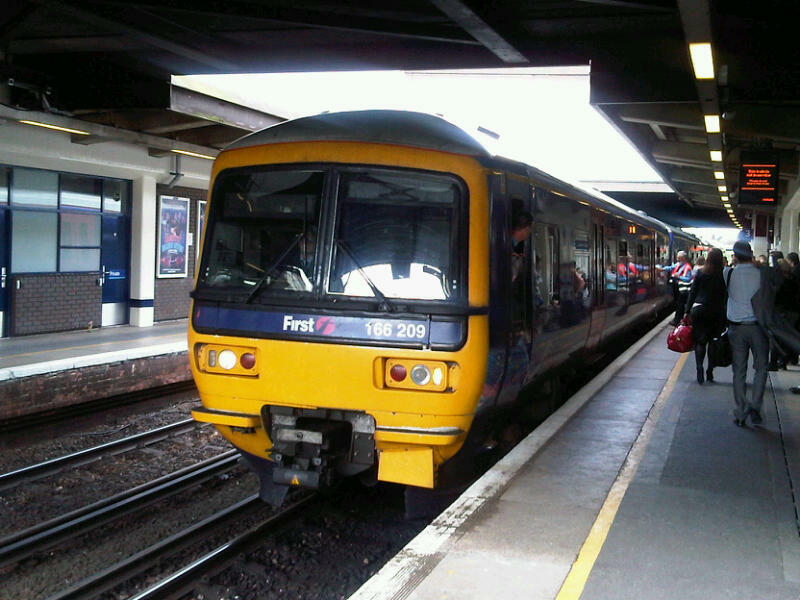 Other than the driver, only two crew worked the service, and having only ever caught a '180' once before, while in service with First Great Western a number of years ago, was very impressed with the interior of the train. First Class tables don't have the integral board games, unlike the HST, but everything else is appears fresher and more modern. Leather antimecassars look very swish, too. We took an absolute eternity to join the ECML, just north of Doncaster. Similar to the Sunderland service, the speed along the non-ECML sections of route is mind-numbingly slow. We waited outside Wakefield Kirkgate for a platform to become available for over 5 minutes yet still had time to kill there before our scheduled departure. That said, it is the direct link the company offer that is a very strong selling point. 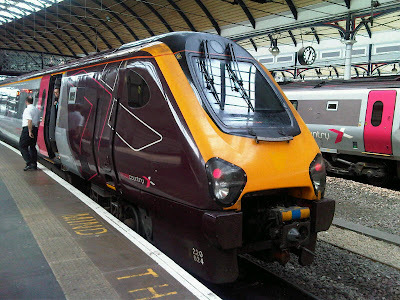 Once on the ECML we called at Doncaster and then direct to King's Cross. We ran up to 10 minutes late as we didn't appear to have a very efficient slot. 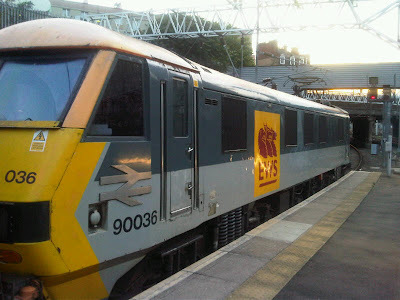 An East Coast '91' overtook us after Doncaster and then we constantly slowed down with this express now holding us up. 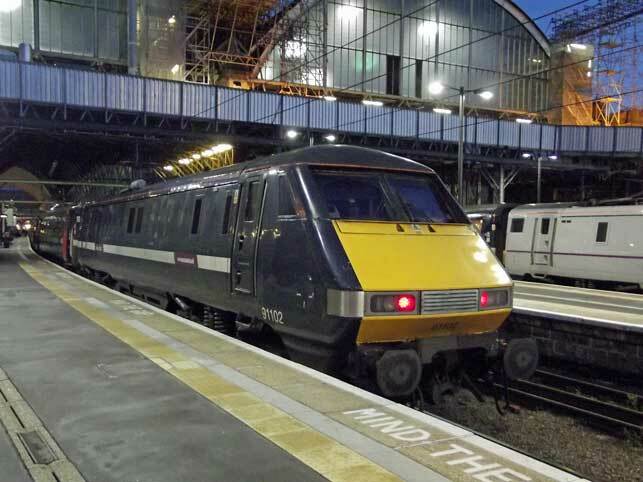 A Class 91 was noted on Platform 3 at Newark Northgate - diagrammed to be a HST and prior to a very bum decision at the end of last year, would have been headed to Lincoln Central. We made use of East Coast's First Class Lounge in King's Cross - we planned on using it on Saturday morning but it didn't open until after our first train had departed - before walking to Euston and catching our second sleeper service of the week, this time to Inverness. Tomorrow is a milestone for two reasons: it is the final day of the 2011 LEYTR Railrover and it also marks this blog's 1,000th post. We're both going to the lounge car to celebrate. Goodnight. I awoke just after 0400 when the Class 90 that had hauled us our of Euston and along the WCML last night, was coupled much nearer to the front of our coach than it had been. When braking it was as if gear changes echoed throughout the sleeper. Not pleasant at all. 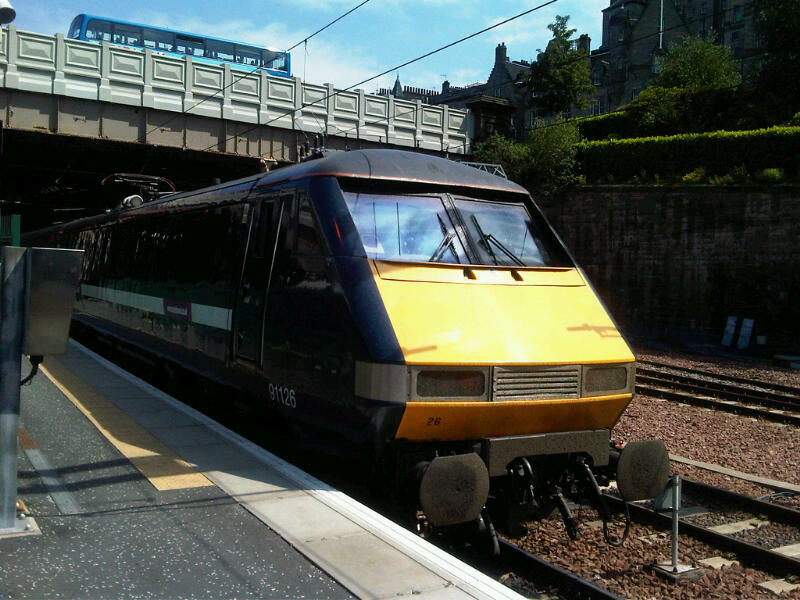 The Inverness portion of the train - 8 coaches today - is the last to be coupled to a Class 67 on Platform 19 at Edinburgh Waverley. We were supposed to depart at 0424 but did so at 0448, with 67030 replacing 90036 at the front. The '67' was much smoother and I soon fell back to sleep and awoke when the host brought the complimentary breakfast, featuring what must be the world's smallest bread roll. All free and welcome though. Except for the UHT milk in a stick! Realising that the London-bound East Coast HST was due to pass us at any moment, I rushed around to try and capture it doing so. We had stopped at a passing loop and it was the train we were awaiting. Not on my phone but on my main camera, I captured a cracking video of it passing that I'll upload in due course. Elation turned to anxiety when we saw how late we were. An expected arrival time of 0848 was showing on the National Rail website and we were booked aboard the Citylink coach from Inverness to Fort William at 0845. I always knew this would be particularly tight. A simple calculation for the time the HST had taken from Inverness, where I knew it had departed at 0755, to our location revealed that we would arrive at 0839 - tantalisingly do-able yet at the same time worryingly tight. Our DB Schenker loco driver gave it the beans and we clocked him attaining 83mph at one point. All very welcome, and we arrived, as I'd roughly calculated, into Inverness at precisely 0839. Without hanging about we made our way to the bus station and saw the coach at the stance. 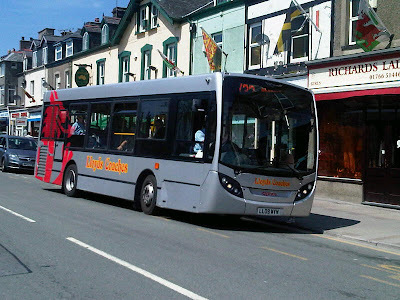 It was in Stagecoach livery, 53209 (SV54 EKP), a Volvo B7R/Plaxton Profile, working the 919 to Fort William. The English driver was very accommodating and told us there was no need to rush as he would be delayed leaving as he was awaiting a mechanic from the depot to sort out his wingmirror, which didn't look in a good way. Can you believe it took 30 minutes for this to be repaired, so we departed at 0915 and the driver drove so hard and fast to make up time that the engine overheated. He stopped at a garage in Invergarry to add cool water to his boiling engine, but the alarm still sounded for the next hour to Fort William. We were both glad to get off for a number of reasons. In Fort William we had time to photograph the portion of the sleeper train that we were attached to leaving Euston the night before and West Coast Railways' Class 37 before our train to Glasgow arrived from Mallaig at 1140: two ScotRail Class 156s that were heavily reserved: 156485+156465. A load of people boarded and after the ensuing melee, we found a pair of unreserved seats for the lengthy journey to Scotland's largest city. I'd only done this route once before in 2005 on the sleeper service heading north and slept through most of it. It is a very spectacular line, slightly less so than the stretch north of Fort William to Mallaig (which I bagged in 2009), but still very much worth the ride. Some of the gradients on this section of line are incredibly steep and perhaps more noticeable with our reduced speed. 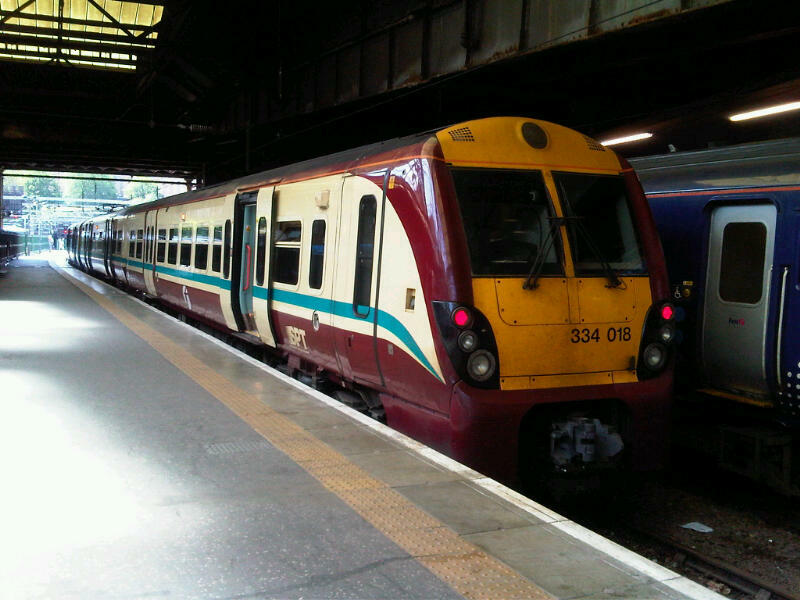 We arrived on time into Glasgow Queen Street at 1530. 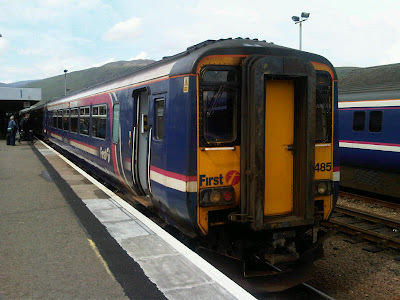 Just two platforms away from where we arrived was our next train, the 1545 ScotRail service to Edinburgh via Falkirk. We'd done the reverse journey on Saturday via the recently re-opened Bathgate line so planned the slightly faster and more direct on this occasion. The small First Class section was very quiet, despite the numbers choosing to travel on this train in Standard, and off we went, aboard 170428 - our first Turbostar of the jaunt. We seemed to run at decent speed throughout and weren't held anywhere but we arrived into Edinburgh Wavereley a few minutes late. Our plan now was to catch the 1700 East Coast service to King's Cross - our penultimate journey of the week. Being Friday evening the train was both busy and, understandably, heavily reserved, especially in Standard, but we managed to get seats in First. A very enjoyable journey south along the ECML with 91102 propelling us. The loco does look rather tatty, with both GNER and National Express branding still visible under the East Coast names. It's Durham Cathedral name, which was given to it by GNER, was still visible on the loco. Inside, we were served the All Day Offer menu, with a change of crew at Newcastle. 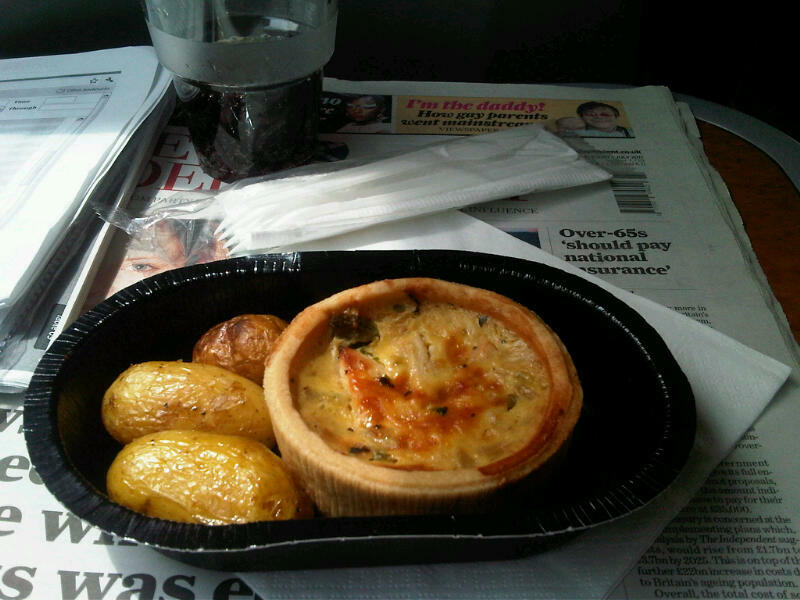 Unlike Virgin Trains, East Coast doesn't offer the Evening Meal menu to any journey other than those leaving London from 1700. 43257+43313 were my final trains of the jaunt, working the 2200 East Coast service to Newcastle, though I would be alighting at Peterborough at 2245, where my lift to take me into railway-less rural Lincolnshire would be waiting. We departed on time and despite East Coast having a ruling about passengers in First Class travelling for less than 70 minutes being only offered drinks and biscuits for free, was both offered and took up a main course in the Evening Meal menu. Plus another G&T for good measure. A very civilised end to a jaunt that has seen a personal mileage of over 5,800 in 7 days.